Ever since video games first hit the scene, designers have introduced new methods to control them. The keyboard, the joystick, the mouse, then the console controller, dance platforms and the advent of gyroscopic controls built into smartphones. But there's never been a game players control by chewing--until now. Tic Tac, the tiny breath mint that won ignominious attention by way of then-candidate Donald Trump a few years ago, finally got into the gum game with the release of sugar-free Tic Tac Gum. And since fans are moving their jaws anyway, who not give them something else to do while they're munching away? "Chew and Play" from TBWA/Chiat/Day New York includes two 8-bit games available through Snapchat lenses named for the two flavors of gum. 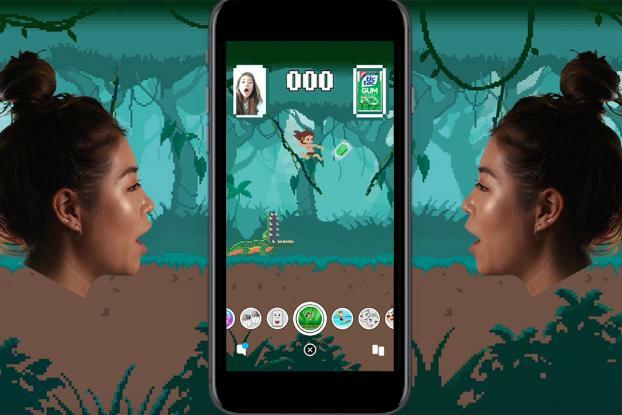 In "Spearmint Jungle," each chew propels a sprite-man from vine to vine over hazards like crocodiles in a "Pitfall"-type adventure. Chewing helps a skier leap obstacles in "Cool Watermelon Water Ski," which looks like an event in "California Games." Would-be players can find both games by swiping up on ads in Snapchat or by using the Snap codes at the end of the video above.